my goal of finishing a 2-hour half marathon remains exactly that: a goal, lofty and probably distant. i would not even dare look at the official results because i know it was worse than my first half-marathon. my training routine (if you could call it that) required me to run an average of 20 to 25kms every week, and i managed to achieve that during the time of the globe run for home. and now i realize i may have peaked immediately after that 15k. however, my schedule was interrupted by many things: long weekend climbs, the elections, my missing nike+ sensor, a trip abroad. i know i shouldn't offer any excuses, but my last run prior to a dismal 5k the wednesday before yesterday's run was april 29. so i was supremely disappointed by my output yesterday, and i am still limping slightly from the experience. however, my biggest challenge yesterday apart from the obvious lack of training, wasn't muscle cramps. i didn't even feel a lot of pain. i was breathing fine, except that every now and then i needed to expel some phlegm. i was in trouble from an excess of gas. not fuel, but exhaust. not another's, but mine. all throughout the 21km course which wound around fort bonifacio like a squiggly knot, i had this awful need to fart. but i was concerned that by releasing gas, its friends might just accompany it. so i had this ball jumping and bouncing inside of me with each stride that hit the pavement. just 3km into the route, i was already about to give up, and i wanted to go straight home from the turnaround in buendia. but what really kept me going was the promise of a pint of häagen dazs. so despite the pinball game being played in my insides, i dragged my lead-heavy legs until the finish line. 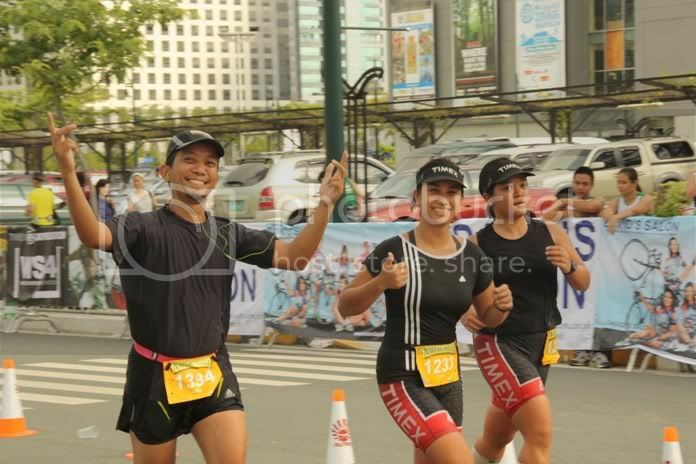 at the turnaround in bayani road, joni and janice towed me along and i kept pace with them, alternately running and walking, and we all finished alongside each other, hand in hand. immediately after i got my loot bag and my pint of ice cream, i walked to S&R and hailed a cab. i just wanted go get out of my shoes. and not to mention, go to a proper toilet. it was a well-organized run, and if i were to believe the prayer led by donna cruz, the event was participated by more than 11,200 runners. coach rio's runs are getting better, and there might come a time i'd stop complaining about the atrocious price tag for the event. i don't know how many of us took part in the 21k, because quite frankly, i'm embarrassed to look at the results. i'm certain i won't be able to match my last good run, where i finished in the upper 21%. but this makes it an even bigger challenge for me. i've just signed up for the half at the 2010 standard chartered singapore marathon this december. it is here where i was first haunted by the ghost of my half marathon time. and it just might be the same venue for its exorcism. i'm still weighing my options though as i am also considering taking part in the angkor wat international half marathon which falls on the same date. still, i hope to resume my training, although i currently have no half marathon event within sight. i'm still hoping to improve my 10k time. i hope this happens soon. I haven't tried a fort marathon. I heard you're generally faster in the fort (i don't know how that is possible) compared to a MOA or somewhere else. Speculations say that the fort is the "official" (ie.) 5K, versus a MOA which would probably measure 7K, and a Greenfield which would be 6.
but of course, i don't believe it. but it's what people are saying. i don't believe it either, although i have not done the MOA course yet. if the organizers are competent, 5k should be 5k, because runners will be fuming mad. i would think the MOA route is easier, since it's flatter compared to the one in the fort where you have inclines. anyway, happy running, and it's now time to do a 10k!